"'Heroes' is one of those rare television series with such broad popular and critical appeal that it has become an instant cultural phenomenon," said Craig Kornblau, President of Universal Studios Home Entertainment and Universal Studios Digital Platforms. "With the extraordinary array of compelling bonus content offered on both the DVD and HD DVD respectively, this title, which has already generated tremendous anticipation among consumers, is well poised to be one of the greatest, must-have DVDs of the year." The seven-disc DVD set is packed with revealing bonus features, including five featurettes, over 50 deleted scenes plus the 73-minute Tim Kring cut of the original series premiere that has never aired on television and much more. The seven-disc DVD version is priced at $59.98 S.R.P. * Unaired Pilot: The Tim Kring Cut with Audio Commentary -- A full 73 uninterrupted minutes of the original, unaired, extended pilot episode, as Heroes' creator Tim Kring first envisioned it, with a character never seen. * Special Effects -- The secrets behind the eye-popping visuals that give the Heroes their amazing powers. * The Stunts -- A back stage look at the show's hair-raising stunts. * Mind Reader -- Matt Parkman's mind reading abilities reveal your inner Hero with a series of simple tests. * Profile of Artist Tim Sale -- A look at the Eisner Award-winning comic book artist (Spiderman, Batman, Daredevil) behind much of the Manga-influenced artwork used in the show. * The Score -- Go behind the scenes with Wendy Melvin and Lisa Coleman (of Prince's The Revolution) as they create their ASCAP Award-winning musical score. Mohinder Suresh (Sendhil Ramamurthy), a genetics professor from Chennai, picks up his late father's research and makes an astonishing discovery -- a seemingly random group of people around the world are developing astonishing super powers. From a drug-addicted artist (Santiago Cabrera), who paints the future and an ambitious politician (Adrian Pasdar) who can fly, to a New York cop who hears other people's thoughts (Greg Grunberg) and a Japanese computer programmer (Masi Oka) who can distort the space time continuum, these new Heroes seem to have a shared destiny. Creator Tim Kring ("Crossing Jordan") fashions a complex new world full of hidden clues, breathtaking plot twists and suspense-filled conundrums for an exhilaratingly fresh story about average people who are confronting the existence of inexplicable super powers. Also starring Milo Ventimiglia, Hayden Panettiere, Ali Larter, Noah Gray-Cabey, Leonard Roberts, Tawny Cypress and Jack Colman, "Heroes: Season 1" is packed with special bonuses that take viewers deeper into this rich and riveting series. 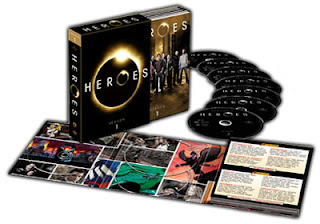 Relive the excitement or discover it for the first time with "Heroes: Season 1" on DVD and HD DVD. Universal Studios Home Entertainment is a unit of Universal Pictures, a division of Universal Studios (http://www.universalstudios.com). Universal Studios is a part of NBC Universal, one of the world's leading media and entertainment companies in the development, production, and marketing of entertainment, news, and information to a global audience. Formed in May 2004 through the combining of NBC and Vivendi Universal Entertainment, NBC Universal owns and operates a valuable portfolio of news and entertainment networks, a premier motion picture company, significant television production operations, a leading television stations group, and world-renowned theme parks. NBC Universal is 80%-owned by General Electric, with 20% owned by Vivendi.